It’s the middle of February and we’re smack dab in the annual barrage of stories detailing what we buy and how much we spend on Valentine’s Day. It’s your usual assortment of flowers, dinners, jewelry, and candy that have been favorites of the smitten for time eternal. But what about the merchants behind that spending? Valentine’s Day might provide a quick boost in revenue to restaurateurs, confectioners, and other establishments, but which merchants are the most profitable? To make that call, we need to zoom out a bit and look at how each of these Valentine’s Day establishments fare year round. The team at Powerlytics pulled the data to see whether it’s the various chocolatiers, florists, restaurateurs, or others that feel the love – and profits – the most. The results were surprising. Looking at the last three years, greeting card publisher profitability greatly surpassed that of many of the other industries commonly associated with Valentine’s Day, when measured by total EBITDA as a percentage of sales. Greeting card publishers have consistently achieved total EBITDA as a percentage of sales of greater than 27% over the past three years. In contrast, no other industry included in the study was even half as profitable. In fact, the beer, wine, and liquor store category was a perennial laggard, never topping a 7% EBITDA ratio in any of the past three years. Interestingly and conversely, while greeting card publishing was the most profitable of the industries studied, its total gross profit was actually the worst of the group. With barely more than 100 establishments, greeting card publishing’s collective profitability amounted to less than 2% of the profits earned by the restaurant industry, which has more than 200,000 establishments. If you’re draining your wallet with every trip to buy your sweetheart a greeting card, you’re probably the victim of an industry that knows how to sell on emotion and earn a handsome profit, especially in contrast to other establishments heavily trafficked around Valentine’s Day. In addition, since there are only slightly more than 100 greeting card publishers left in the United States, they understand how demand far exceeds supply around the holidays, especially Valentine’s Day, leading to price insensitivity that’s key to generating attractive profits. Greeting card publishers can also capitalize on our genetic failure to prognosticate better than other industries. They understand their market is usually pressed for time and really can’t shop around for a greeting card, enabling them to avoid any form of discounting. The same cannot be said for the other establishments in our study, where, outside of a few exceptions, profitability was clustered in the 10% to 11% range. Other establishments have more options for consumers than greeting card publishers. There are more than 32,000 beer, wine, and liquor stores, for example, which seems to diminish their pricing power. They also typically don’t benefit as much from the demand/supply imbalance that comes with holidays like Valentine’s Day. After greeting card publishers, the industry that was second most profitable across the last three years was jewelry stores, with profitability ranging between 11.3% and 11.6%. Retail bakers followed close behind, with profitability ranging from a high of 13.1% in 2011 to a low of just 11% in 2012. Gift, novelty, and souvenir stores were the only other industry to have at least one year with profitability of at least 11%. All other industries had profitability that was consistently below 11%. Some of the findings were quite interesting. For instance, the profitability of cosmetics, beauty supply, and perfume stores was no better than 10.1%, and was actually below 10% in two of the three years. That’s an industry you would expect to be far more profitable, not two-thirds less profitable, than greeting card publishers. And who would have thought that profits at florists and restaurants are virtually identical, despite such different products and more than 20 times more restaurants than florists in the United States. 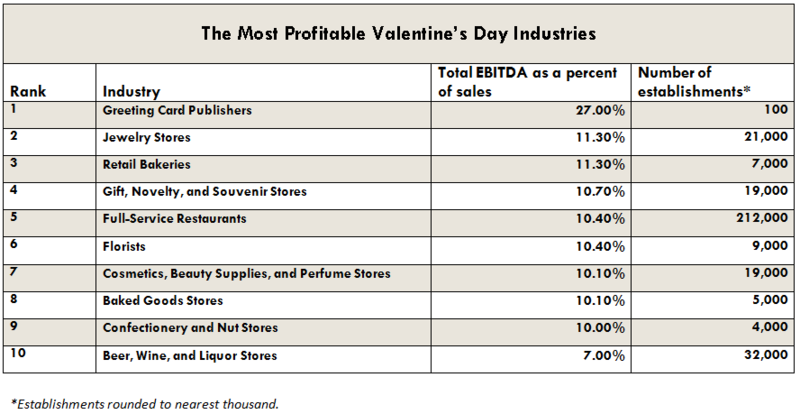 A full list of the profitability of the various Valentine’s Day industries covered in this story is provided below. While the list holds some surprises, one thing is obvious: These establishments offer a range of gifts any valentine will love.